I read a lot of articles and books on food history and how changes in technology change our relationship with eating and the process of cooking itself. Looking back at the evolution of kitchen technology can result in quite a jolt – it’s fascinating to see how much of what we think of as our culinary culture is the product of technological change, and how much of what we consider tradition is actually relatively modern. One such ‘tradition’ is that of the reheating and re-eating of ‘leftovers’. While uneaten prepared food is likely to be as old as human beings’ relationship with the cooking process itself (unless our caveman ancestors were really excellent at judging portions of mammoth), the concept of ‘leftovers’ – a prepared meal served again and again, in the same form, until it’s done – is much newer, and is tied to the history of refrigeration and, more importantly, the arrival of fridges into the family home. Prior to their introduction, the concept of ‘leftover’ food appearing on the plate in more or less the same format didn’t exist as such – it was all simply treated as ingredients, continuously reworked and reformed into new dishes. A a roast slab of beef or lamb would be diced into a fine mince, mixed with the leftover gravy and some vegetables, and baked with a topping (and indeed lining) of mashed potato to make a cottage or shepherd’s pie. The pies we make now, using fresh raw mince which is cooked specially, is much more modern. Cooked meat chopped fine formed the basis of many a dish, most of them quite similar: rissoles (breaded patties), cutlets (patties formed into a shape supposedly resembling an actual cutlet), and even something called ‘beef olives’ – thin slices of beef wrapped around vegetables, covered in stock or broth and cooked for an unfathomably long time. Reworking leftover bits and pieces of food has the advantage of staving off the extreme boredom that can result when eating, say, the same bowlful of carrot soup night after night, especially if the dish you made isn’t something that necessarily gets better with time. I don’t own a freezer, so when I make a dish that yields a lot of servings, I unfortunately don’t have the satisfying option of popping it into a neat labelled box and stowing it away for busier days. A while ago, I made a large portion of ratatouille from a slimming cookbook. I think my liking for ratatouille is a bit more theoretical than actual – I don’t like cooked fresh tomatoes, for example – and calorie-controlled recipes tend to bulk up on watery courgettes rather than delicious, melting, oil-absorbing aubergine. Safe to say, my liking for the recipe was moderate, but there were at least four more portions in the pot after dinner. I served it up in two relatively simple new ways, one on a working night and one on a Friday night. Firstly, with courgetti. Here, doubtless, some people may already be turning away in faint disgust. The courgetti backlash is commencing in earnest at the moment. Spiralised vegetables have come to symbolise the clean eating movement, so it’s unsurprising that, as we enter the moment where the media is turning against clean eating as rapidly as it embraced itrapidly as it embraced it, the vegetable noodle has become severely castigated. I’ve seen them described as tasteless, bland, boring and deficient in terms of the ‘energy’ they offer. And yet I persist in quite liking courgetti. Maybe it’s because my interest in acquiring a spiraliser to make vegetable noodles predates the clean eating movement by a good number of years, ever since I saw a post on Chowhound about daikon noodles. I thought the idea was fun and added some interest, the opportunity for innovation and fun textural contrasts, but back then acquiring a spiraliser was more complicated and expensive than it is now; the Lurch model I wanted was perennially out of stock on Amazon and cost about a third more than they do now (demand and supply, right there). And now that spiralising vegetables is easy, the noodles themselves represent everything about a food culture gone wrong; they mean fear – of gluten, pleasure, wheat, fat, abandon, gluttony. Still, let’s not get hung up on what food symbolises. I still like them and yes, courgette is less energy-dense than spaghetti, so eating it carved into noodles can be helpful if you’re monitoring your calorie intake, which I try to be conscious of. There, I said it. So, the day after I made the fateful never-ending pot of ratatouille, I spiralised two courgettes into thin, satisfyingly long noodles, reheated the ratatouille with an addition splash or two of water (in addition to not having a freezer, I do not own a microwave), and then dropped in the courgetti to cook and lose their raw edge in the sauce for a couple of minutes. I think this is key with vegetable noodles: no matter how much people may try to convince me otherwise, the idea of eating raw courgette rarely appeals. So the nice thing about this was that it was very quick: slizzing the courgetti into noodles, warming up the ratatouille and cooking the vegetable strips was actually quicker than boiling up spaghetti would have been, and although it does then require washing up the spiraliser or julienne peeler used, this is no worse, to me, than washing up the sieve I use to drain pasta, which always gets gunged up with the thick, starchy pasta cooking water. I served this up with the ubiquitous clean-eating favourite, the avocado, and – less celebrated among the clean eating who walk among us – soft goat’s cheese (I think Lidl’s is very good but also like the one from Sainsbury’s). I enjoyed it a lot. Secondly, baked into the centre of a halved butternut squash. This is inspired by a recipe by Lorraine Pascale. In her book ‘Eating Well Made Easy’‘Eating Well Made Easy’ she serves a sort of proto-chilli con carne with avocado and cheese inside a halved butternut squash. While I’m not entirely convinced by Pascale’s enrolment at the somewhat dubious Institute for Integrative Nutrition, I thought the recipe looked good and I was inspired to try something similar. I bought a quite small butternut squash (as you can see above, the squash I used was a little smaller than a dinner plate; although dinner plates can, these days, be huge, the one in the picture is a modestly-sized Denby plate), cut in half vertically and scooped out the seeds in the cavity. I then slashed the flesh with a small sharp knife, cutting about 1cm deep and rubbed it with some oil and seasoning before baking for just under an hour in a preheated 200C oven. Once the squash was tender, I piled in the remaining ratatoutille in the squash cavities and baked it for about ten minutes (to heat through) before topping with grated Parmesan – Emmental would be great here too, because it melts beautifully in delicious, gooey, molten, appetising strings. The cheese-topped squash was returned to the oven to allow the Parmesan to melt. The resulting dish was served with a dollop of creme fraiche – somehow the addition of cool, tangy lactic fat offsets the fat from the cheese and provides a good contrast to the vegetables and starchy squash. About once a month, a select (ha) group of culinarily adventurous friends and I meet up to cook and eat together. We rotate between each other’s homes and each evening has a theme. It is, in short, a supper club, or dinner party club, except that not every gathering is actually in the evening. Our very first themed dinner was ‘Harvest Festival’ and, as you might expect, it was held in early autumn. Themes which have been particular favourites of mine have included ‘Middle Eastern Afternoon Tea’, particularly memorable because I served up muhammara according to Diana Henry‘s addictively good recipe from Crazy Water Pickled Lemons, and I read up a lot about Anglo-Indian food and heritage for our ‘Indian Summer’ themed lunch – anything which combines food and history is going to be all right by me. (In case the name seems odd, it was an homage to the Channel Four show ‘Indian Summers’, which dramatised the final years of British colonial rule in India.) In January this year I hosted a Burns Night themed evening in which anti-haggis prejudices were overcome by suspicious southerners, and even the vegetarian haggis was well-received. (I love haggis – if you love a big, spicy, crumbly meatball I urge you to try it when the weather cools down). A friend’s boyfriend gamely read Robert Burns’ ‘Address to a Haggis’ in a broad Scots dialect, a feat which was all the more impressive considering a) a Scottish amount of alcohol had been consumed and b) it was the first time he’d met us, and standing up in a room full of strangers to read a poem in Scots dialect sounds like the worst kind of trial. (Indeed, as a little girl I ran sobbing out of a room full of people at the Belgian and Luxembourg Association of Singapore‘s annual St Nicholas’ Day party when asked to read a poem in Dutch – i.e. my first language). More recently we had a Japanese-themed lunch, although it was called ‘Cherry Blossom Festival’, and was a celebration of both the warmer weather as well as the elegant, simple yet satisfying flavours of Japanese cooking. My friend Tina served us miso soup and stickily sweet chicken yakitori in her tiny Covent Garden flat; the windows were thrown open wide to embrace the sun and warmth coming in. I brought a salmon and edamame rice salad which was inspired by one of my absolute favourite bought lunches from Itsu, a chain which specialises in light, healthy Asian takeaway meals: teriyaki salmon on a bed. In addition to salmon (obviously) and rice, this dish includes edamame beans, which you can buy in the frozen section of most supermarkets, usually labelled ‘soya beans’. I much prefer them to the more British broad bean because they do not require a second podding after cooking. The components of fish, rice and bright green beans are easy to bring together. Such is the popularity of Japanese food that the ingredients can be bought at any standard supermarket. Salmon rice bowl – we had already tucked in! It’s my friend Juliet, however, who shines in preparing food which is delicate (never quite as twee as ‘dainty’) and beautifully presented. She loves Asian food and predictably stole the show with some beautiful matcha cream puffs. The matcha creme diplomat used to fill them was rich, but the addition of whipped cream made it one of those dangerous foodstuffs whose saturated fat content is belied by the absolute lightness on the tongue. The floral taste of the creme diplomat was a perfect match(a) for the delicate texture of the puffs. Juliet also had some extra matcha creme diplomat with her and I can attest that, in addition to cream puffs, it is utterly divine piped or spooned into raspberries cavities or squiggled onto frozen yoghurt. In addition to the crisp little choux buns, there’s extra textural interest provided by a layer of craquelin, which gives the tops of the buns a pleasing giraffe-like pattern. Craquelin is effectively a pressed Francophone crumble topping – a disc of flour, butter, and brown sugar – which somehow makes the whole thing sound a lot less like you need a Cordon Bleu qualification and more like something that can be achieved at home. A number of weeks ago two things coincided. One, I developed a sudden desire for beetroot. This is a very odd craving indeed. Beetroot is strongly, almost overpoweringly earthy, and difficult to cook – I find it takes much longer than most recipes give to actually go tender, especially when the recipe requires you to wrap it in foil and bake. In the UK it’s often sold cooked and vacuum-packed, pickled in strong, malty vinegar: an acquired taste by any means. However, I decided to go with the flow and bought a packet on the way home from work. The day after I bought the beetroot was, coincidentally, a working from home day (I’m lucky enough to have one a week), so, come lunchtime, I could contentedly potter around my kitchen and pull something together based on all the delicious things in my cupboards, fridge and fruit bowl. The result was this colourful, punchy salad, which combines lots of great things. Firstly, the base is quinoa, a slightly grassy seed (a renowned superfood, it is often mistakenly referred to as a grain) which offers a high protein content (in fact it is a complete protein, rare in plant-based foods), as well as a relatively high micronutrient content, packing in particularly high levels of folic acid. I also like the taste, which is ever-so-faintly bitter. I combined this with the beetroot I’d bought – they were small, tender, and only gently pickled, lending some heft and a slightly acidic tang to the mixture. The flavour was punched up with some spring onions and rocket which were knocking around the fridge, and a slosh of lemon juice: sharp, peppery, bright. The whole was brought together with the cool, creamy blandness of avocado – such a calm flavour – and the lactic savour of feta cheese. Well, I used light feta (the taste was indistinguishable from regular, if you ask me), but you should feel free to use the regular kind. Halloumi or soft goat’s cheese would also pair beautifully with the grains and beetroot. Eating quinoa, despite it receiving many a clean-eating stamp of approval, is not without its controversies – the export of this staple Andean crop for superfood-hungry Americans and Europeans is sending the price skyrocketing, meaning that local people in countries like Bolivia and Peru, where the crop is traditionally grown, can no longer afford it. Obviously, there are serious tensions and difficulties surrounding the export (or restriction thereof!) of many foods around the world. I personally don’t eat quinoa very often so am as comfortable with my consumption levels as I can be; the issue is complex and the boom in the export of quinoa can help communities as well as damage them. I find that quinoa is satisfying but doesn’t always leave me full for very long. Combining it with the high-fat avocado (I feel compelled to use the magic words ‘good fat’ here! Avocado fat is cholesterol free) keeps me fuller for longer, and obviously the rocket and beetroot help bulk the salad out. I like crumbling the feta cheese very small so that it is well-distributed across the salad and to stretch it out, so that each mouthful has some cheese, rather than the first few. This recipe is for a dish I threw together at the weekend. 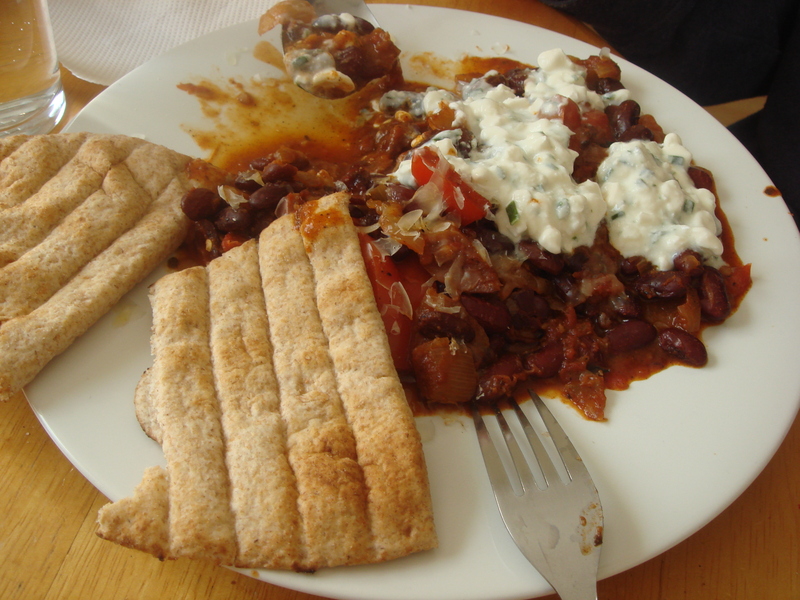 We’d had half a bag of red kidney beans sitting in the cupboard for about a hundred years, and I decided the time was right to use them up – for whatever reason I’m itching to clear out cupboards and declutter. 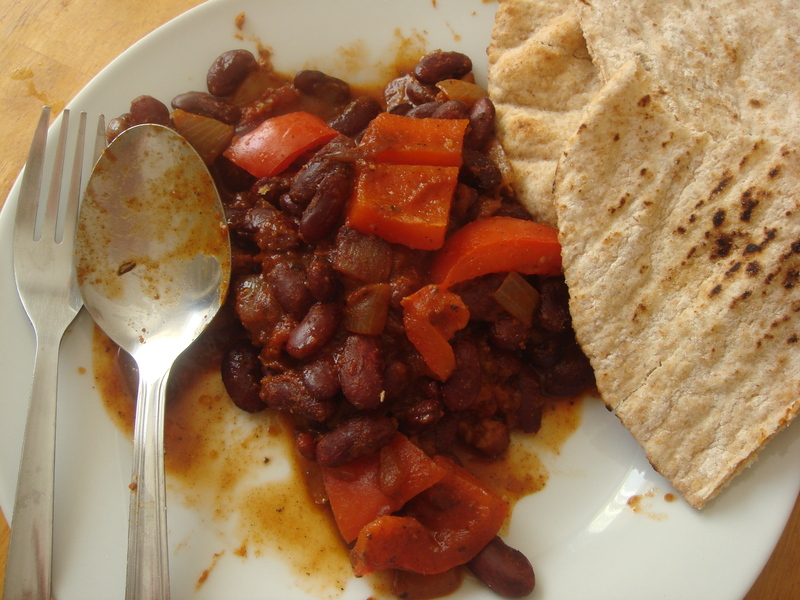 I soaked them a few days before (I store the soaked beans in the fridge until ready to cook) and, using various bits in the cupboard and fridge, I threw together a richly spiced, juicy, tomato-tinged red bean stew. It wasn’t going to make it into the blog – since it really was just a spontaneous, on-the-fly meal – until my boyfriend suggested it. “This is amazing!” he said (it is really good – hearty and flavourful). When I told him it was my own recipe, he insisted I blog it: “The baking challenge is fine, but you can find those recipes somewhere else. You can’t find this one anywhere, since it’s yours!” He added that he thought it might be useful for other people putting together a meal based on storecupboard staples. So, I hope it is. dial down the paprika, add grated fresh ginger, a teaspoon of turmeric and sprinkle with chopped fresh coriander at the end, and it would become an Indian-inspired, not-quite dhal, for example (if going down the Indian route you could substitute various lentils for the beans, as well. I’ve made a version of this using urad dhal).Serve with naan bread or steamed rice. To make something more Italian-inspired, use cannellini or butter beans, add two chopped carrots and two chopped celery sticks to the onions, and omit the dried herbs. Chop through some fresh parsley or basil and stir through some lemon juice at the end and serve with parmesan. If you feel inspired by the flavours of Morocco, use chickpeas and add one or two chopped carrots to the onions. If you have any preserved lemons, chop one up and add it to the pot, and stir through some lemon juice at the end. Serve with couscous. The above suggestions might not be strictly authentic (hence my careful use of the word ‘inspired’), but using these flavour profiles will enable you to put together a dinner based on almost any dried or tinned pulses you may have. I use a lot of spices in this recipe, because I definitely prefer strong flavours, and I think the starchy, substantial red beans can take a lot of flavour. If you’re baulking at the idea of throwing in spices by the tablespoon, by all means reduce the amounts. I thought it might be fun to write up my week in food – I love reading articles with that theme, as it satisfies that inherently curious/nosey part of me that’s interested in what people get up to, and it can provide mealtime inspiration as well. Instead of all my meals and snacks, however, I’ve put together my week in breakfast for the previous week. I typically have a lighter breakfast (though not always), and this tendency has been exacerbated by my relatively recent weight loss regime, as I prefer a more substantive dinner. I have however experimented with having heavier and/or more protein-rich breakfasts as protein in the morning apparently keeps you fuller, and this has usually worked well for me. I do find that surprisingly small portions keep me going until mid afternoon for much longer than I’d expect if I add something like a tablespoon of almond butter to enrich them. 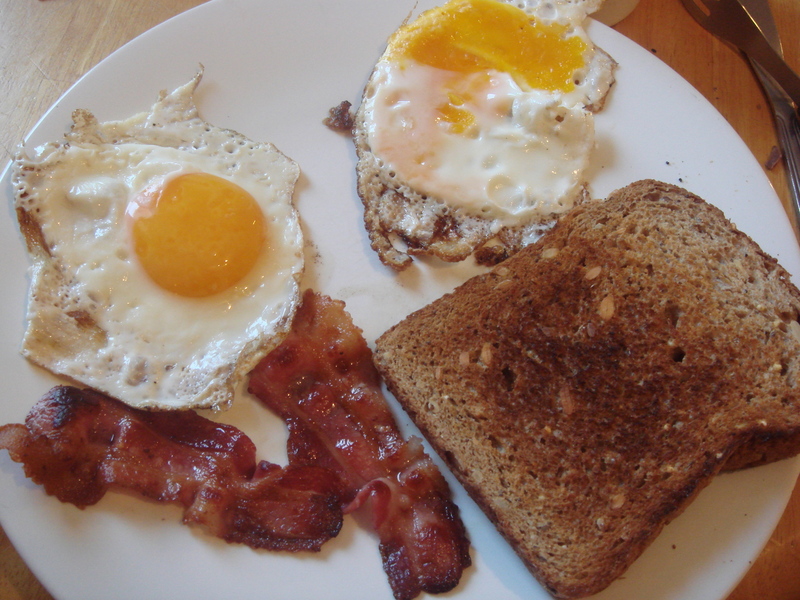 This isn’t a typical weekday breakfast for me, but we had a few rashers of leftover good-quality bacon in the fridge, and I occasionally have eggs in the morning as I’m trying to increase my protein intake, so I decided to put the bacon to good use. The slice of wholemeal bread is unbuttered and perfect for dipping into the egg yolk – I have the yolk as runny as humanly possible. 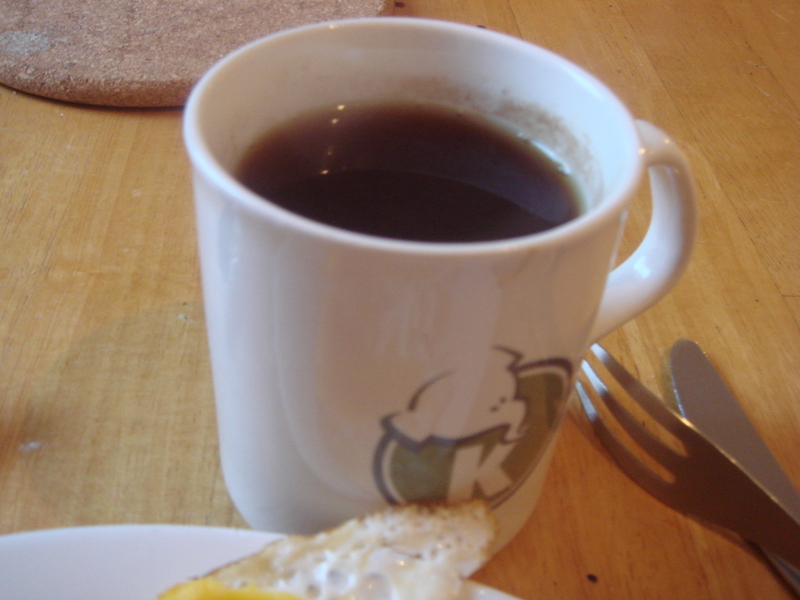 I have a mug of black tea with a teaspoon of honey every morning. 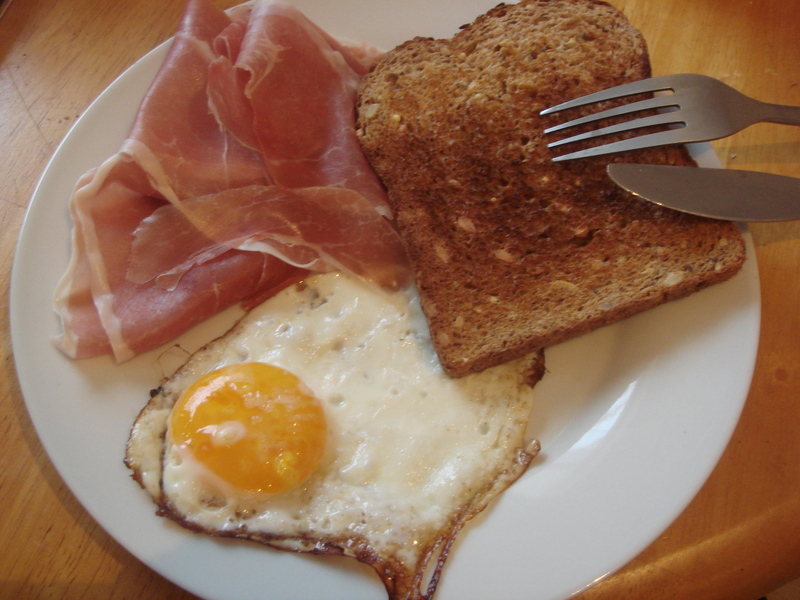 Similar to Monday’s breakfast, but with the last egg in the fridge…and this time making good use of some leftover prosciutto a friend brought us when she came round. (I have good friends). Smoothies are all the rage, though I struggle to drink those kale, blueberry and maca powder concoctions so praised for their health benefits. Although this recipe does contain the usual suspects like spinach and coconut water, it’s cleverly disguised as a chocolate smoothie (using raw cacao powder, of course). 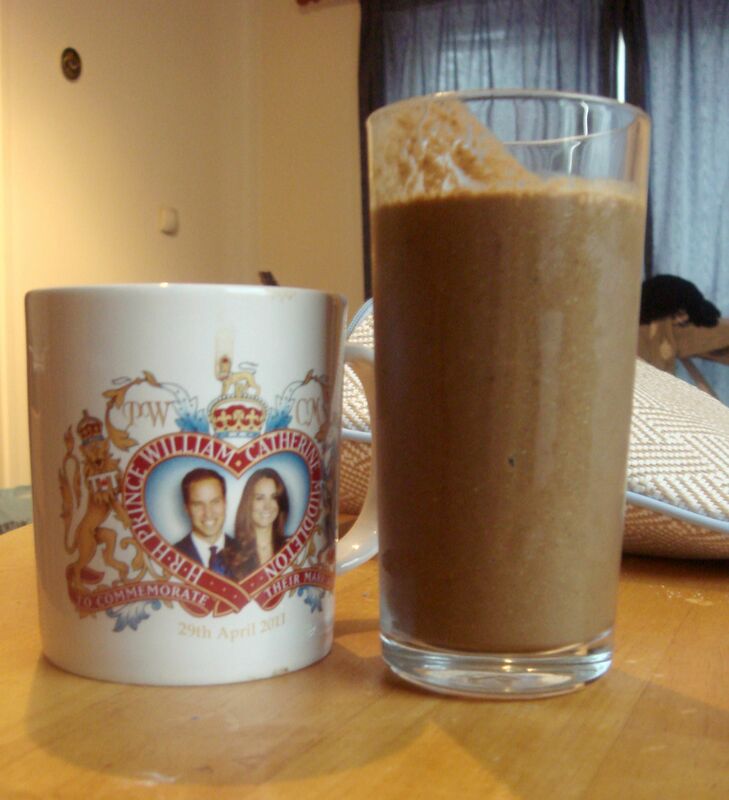 The flavour is very good; it tastes rich, creamy and indulgent, despite not containing any dairy and, most shockingly to a smoothie sceptic like myself, it did actually keep me full until lunchtime, probably because of the addition of almond butter and chia seeds. The only sweetener in this is a banana – I let mine get very ripe indeed before using and this was sweet enough for me, but you could add a little maple syrup or honey to taste if you prefer it a little sweeter. I based this on a recipe found on Gym Bags and Glad Rags and have made it many times. My version below. Put all of the ingredients together in your blender and mix until smooth. Dinner on a Friday evening – the end of the working week – is, I think, the most difficult meal to put together. By the end of the week you’re tired, thinking longingly about the weekend and dismally about the mountain of work still on your desk to clear. The meal plans I put together on the Sunday have probably unravelled by Friday and I’m left with either leftovers from three weekday meals (about three mouthfuls each) in unlabelled food storage containers at the back of the fridge, or maybe a couple of carrots, a sad looking bag of spinach and half a butternut squash. Probably half a cake, whose temptations now seem all the greater. By the time I’m home my imagination usually fails me entirely and I struggle with deciding what to cook – despite an hour of empty travelling time on the Tube to figure it out. So on Fridays there tends to be either a bit of a rummage through a fridge of slightly wilted produce, or a capitulation in the form of a run to the local fish and chip shop. As good as the fish and chips and lovely as the couple who run the place are, this is not an option for me given the ‘dietary recalibration’ I am currently putting myself through. Instead, there are experiments with salad. Salad! I have never hitherto really considered a bowl of lettuce a proper meal…and I still don’t. A bit of soft butter lettuce, a handful of cherry tomatoes, maybe a scattering of chives or parsley…this is the stuff of a side plate. To be a real, proper meal – satisfying, filling and nutritious – you need different textures, and it needs to be loaded up with more than twelve varieties of rocket. If you’re having salad for a meal, lettuce and its varients aren’t constituted of a whole lot beyond water, and finding nutritional balance is even more important for me as I’m restricting my calorie intake temporarily, giving me fewer instances in which to find the nutrients my body requires. At the very least there should be a protein component to keep you going for a bit. So, a salad perfect for the Friday evening rummage (though no less suitable for lunch). This one is quick and offers enough interest to suit both a dieter and a non-dieting partner or friend, if those are your circumstances. 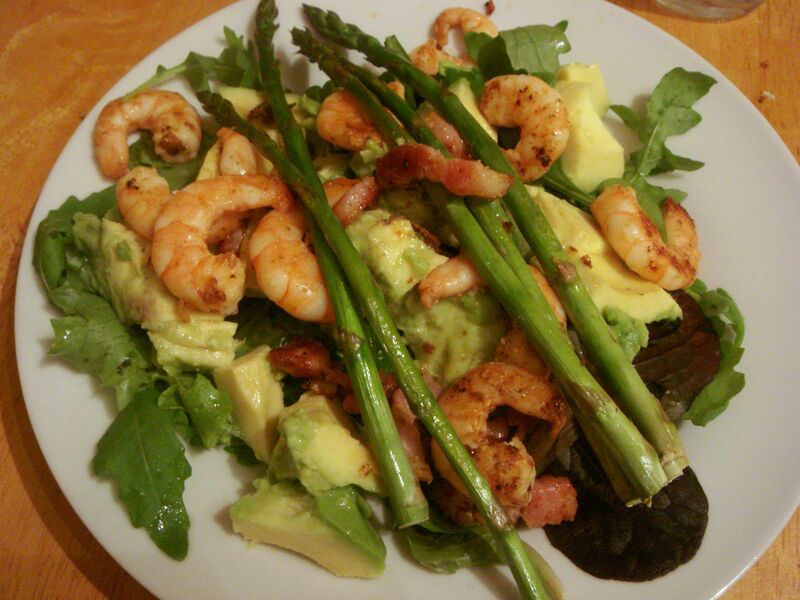 The most important thing is that, in terms of taste, this salad is utterly rewarding to eat: delicate, slightly bouncy prawns; crunchy, salty lardons; sweet asparagus; creamy avocado. It all comes together beautifully. In many ways the lettuce is just token. 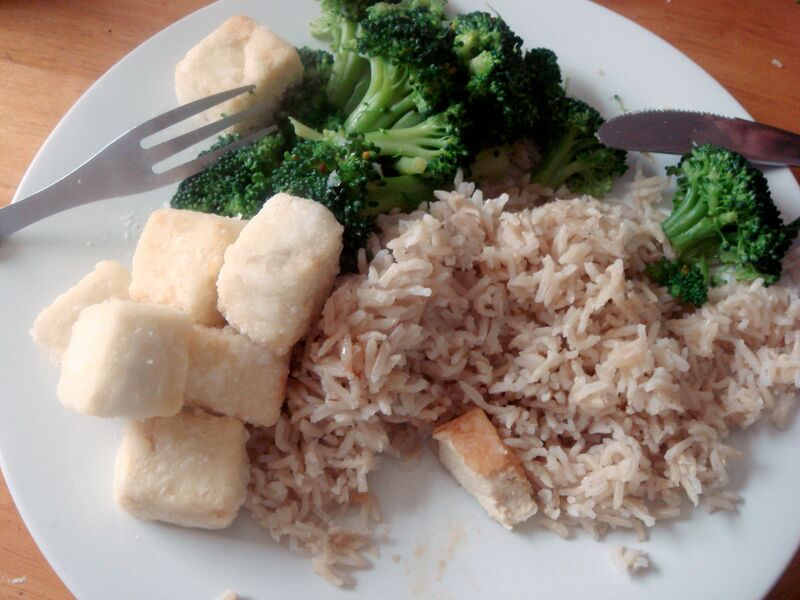 This meal – crispy tofu, steamed or blanched broccoli, and plain brown rice – is one that brings me right back to my childhood, and in many ways I think it epitomises hippie vegetarian food for a lot of people (although vegetarianism is no longer the preserve of hippies). There’s the tofu, the brown rice, the lightly cooked cruciferous vegetables. 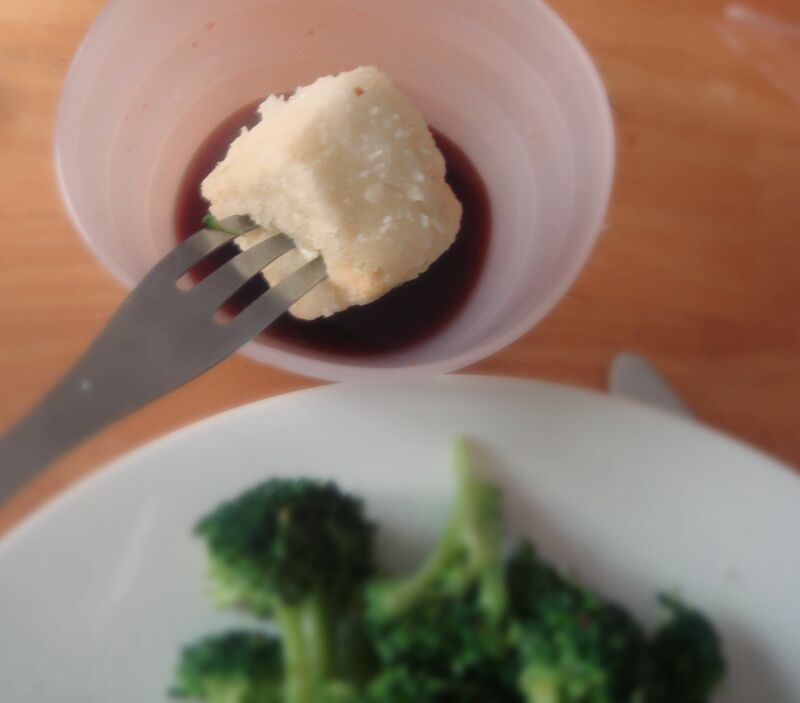 This is healthy, wholesome food, plain (but not tasteless) and uncomplicated – I imagine this simplicity is actually what appealed to me as a child. But for all its simple lack of pretension, it has much to please an adult palate. The quintessential hippie vegetarian triumvirate: tofu, cruciferous vegetables, brown rice. I love it! Firstly, the meal offers a contrast of taste: nutty rice, milky tofu and sweet green broccoli. There’s also a satisfying interplay of textures between the grains, slightly firm but silkily yielding vegetables, and the crunchy tofu coating which gives way to the jiggly beancurd beneath. For me this is a standby recipe: I don’t make it every week, by any means, but it’s always there in the back of my mind if I have a pack of tofu sitting in the fridge.